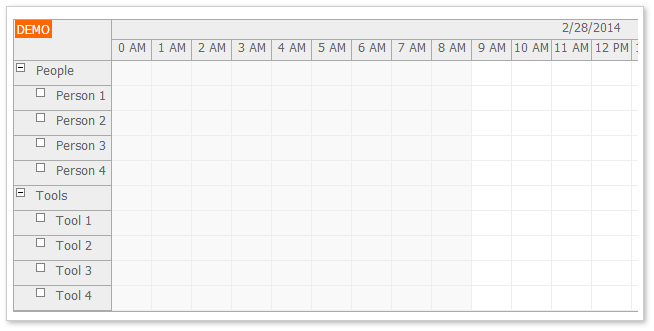 This tutorial shows how to build a HTML5 scheduler application. It displays multiple resources (grouped by category), with support for drag and drop operations (moving, resizing). We will load the scheduler resources using a simple loadResources() method. It uses jQuery to request the resource data from the server-side backend_resources.php page. We are loading the resources after the scheduler initialization (after init() method is called). You can also fill the .resources array during initialization. We will enable the resource tree using treeEnabled property. It is necessary to modify the resources array to include the resource parents and children. The default scheduler scale is set to display 1 day, divided to 24 one-hour cells. We will set the scale (cell duration) to 1 day and display the current month. We will customize the time headers using timeHeaders array. The scheduler displayes time cells width fixed width (40 pixels) in the default configuration. We want to get rid of the horizontal scrollbar. We will use cellWidthSpec property to adjust the cell width automatically to match the total control width (100% of the HTML5 page). The cell width is adjusted automatically on window resize. We will load the scheduler data (events) using an AJAX call in loadEvents() method. Drag and drop is enabled by default in the scheduler. The event resizing uses an event-handling mechanism similar to event moving. The onEventResized event is called as soon as the event position is updated. We will use it to update the database using an AJAX call. We will handle drag and drop time range selection to invoke a new event dialog and create the event. There is not default action associated with time range selecting so we will need to create the event manually as soon as we receive its ID from the server. You can invoke a modal dialog for editing the events details using DayPilot.Modal helper. DayPilot.Modal class is included in the DayPilot package (daypilot-all.min.js). This page will submit the form using an AJAX call to backend_update.php.